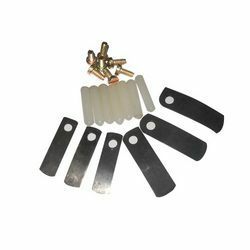 The offered range of quality Rotary Machine Spares Parts provided by us is inclusive of Dielocks Screws Teflon Patti, Feed Frames Assly and Dielocks for Tablet Machines. Manufactured using the finest raw materials and high-tech machinery, these products have an exceptionally long life and commendable performance. We are a leading manufacturer and supplier of a robust range Dielocks Tablet Machine. High grade material that is sourced from most trusted and reliable vendors of market is used in the manufacturing process. Besides, we assure timely delivery of consignments at clients' doorstep.